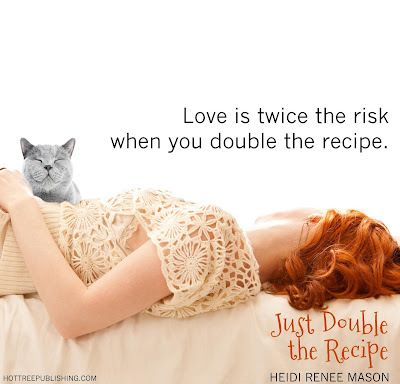 Love is twice the risk when you double the recipe. Free-spirited, eccentric Willow Simpson is content with her life. She’s living her passion as the owner of The Dancing Crepe, Portland’s hottest food truck, has agreed to marry her life-long best friend, firefighter Tate Randall, and she loves showering attention on her finicky cat, Omelet. Things are perfect and she wouldn’t change a thing. Unfortunately, change is the name of the game for Willow. Tate is rushing to set a wedding date, and although she loves him, she’s in no hurry to take a trip down the aisle. In an attempt to ignore her pending nuptials, she puts her focus on expanding her business. 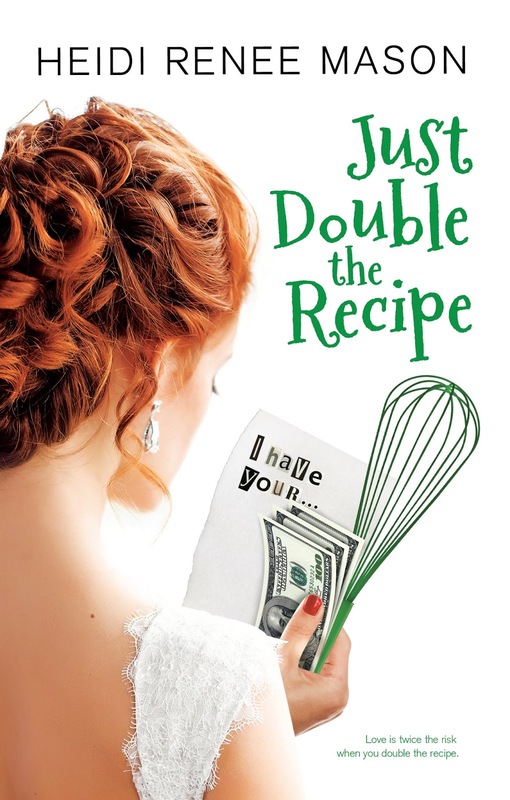 Just when her life seems to be cooking at a comfortable simmer, the heat is increased and she must douse the flames before everything goes up in smoke. 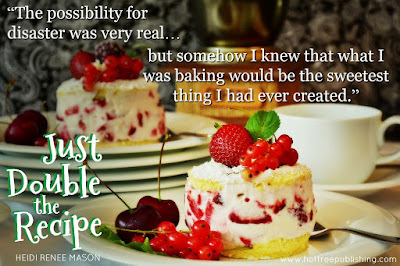 As new connections enter her life, unexpected chaos ensues. Will she be able to protect those she loves the most? Will she realize that everything she has ever wanted has been right in front of her all along? Love is twice the risk when you double the recipe! “Babe, your alarm has been going off for five minutes. Are you planning on getting up today?” Tate gently shook me awake. “I don’t want to get up yet. It’s still dark outside,” I groaned as I rubbed sleep from my eyes and then buried myself beneath the covers. To further demonstrate my distaste, I placed my pillow over my head. “I obviously did not choose my career path correctly. Why does five o’clock in the morning have to get here so soon? I’d like it a whole lot better if it happened later in the afternoon.” I moaned again, pulled my head out from under the pillow, and reluctantly rolled out of bed. Early mornings and alarm clocks were not my friends. If I had my preference, I would like to awaken naturally, around noon. One would think I would be used to the early morning routine after having done it for so many years. One would be sadly mistaken. Even though my occupation as a baker demanded it, the sad truth was that I would never be a morning person. It just wasn’t in my DNA. Omelet, my finicky, opinionated gray cat, was curled up in a ball at the bottom of the bed. Normally she slept on my chest, or sometimes on my face. Boundaries and personal space were nonexistent with her. She was the equivalent of a temperamental toddler most of the time, but I loved her more than life itself. Omelet was a spoiled princess, and she knew it. She ruled the roost in my house. She glared angrily at me, my movement disrupting her slumber. She sighed loudly, kneaded the space below her once again, turned her back to me, and covered her face with her paws. If cats were able to roll their eyes, I knew she would have been doing it. She hated mornings even more than I did, and she did not want to be disturbed before she was ready. Omelet was the best pet a girl could ask for, but she certainly knew how to hold a grudge. I would be working for days to get back on her good side after waking her up too soon. He winked at me with those gorgeous green eyes of his as he pulled me tightly into a bear hug. His hugs were at the top of my list of favorite things. Being wrapped up next to my favorite fireman gave me the same sensation as sinking into a warm bubble bath, or taking the first sip of my morning coffee. It was pure perfection, and I couldn’t seem to get enough of it. I couldn’t believe it had taken me so long to decide that I wanted to be with him, but commitment had never been my thing. I was still trying to figure it all out. 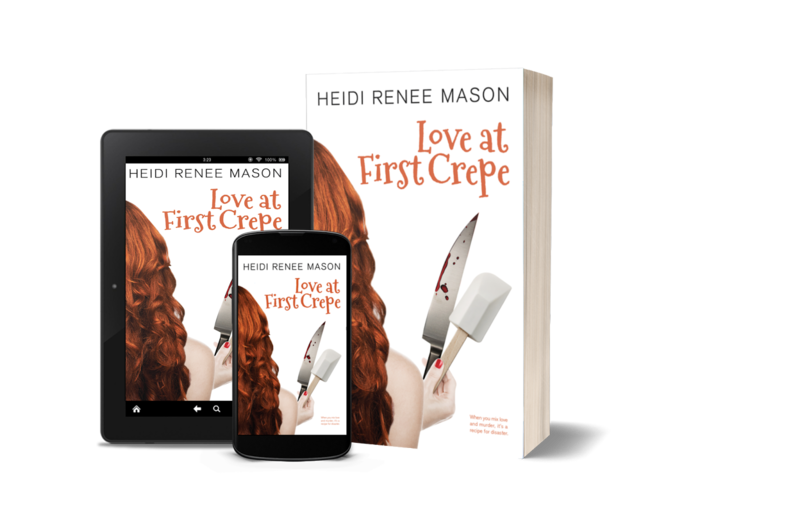 Who knew a delicious crepe, a kung fu attack, and an unexpected love could create such mayhem. 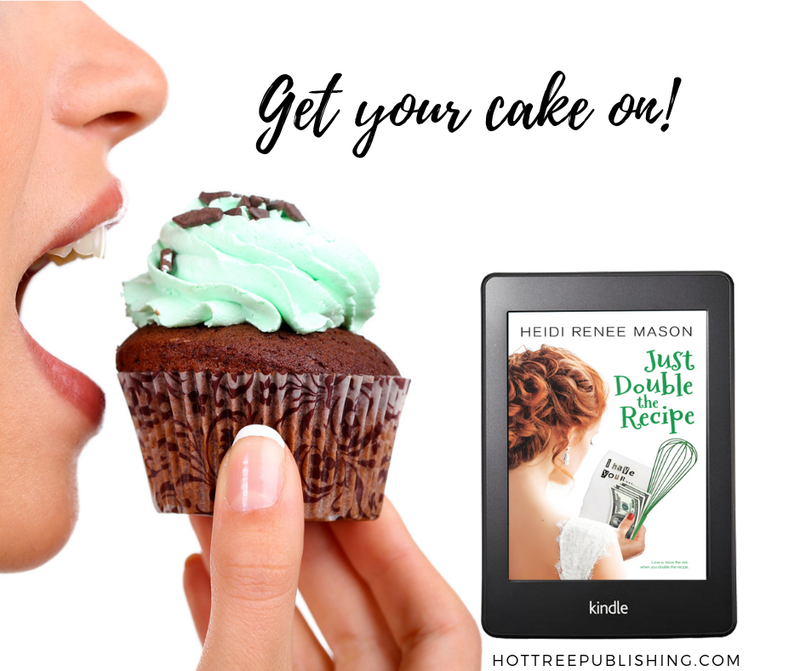 In Heidi Renee Mason’s humorous romantic mystery, an easygoing chef soon discovers life can become complicated when you’re busy falling in lust and foiling murder plots. 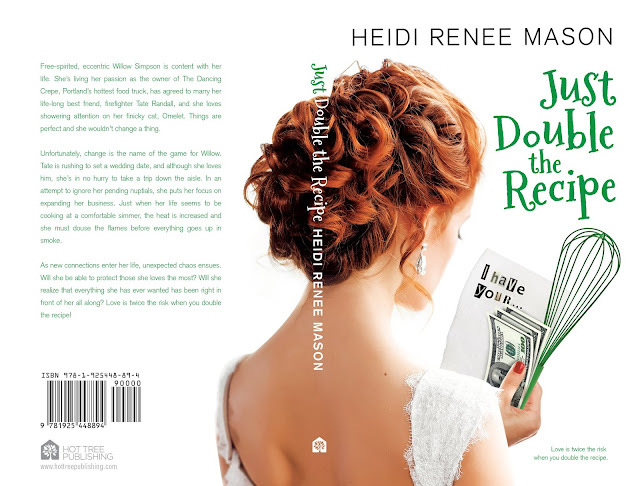 Heidi Renee Mason is an Ohio girl transplanted into the Pacific Northwest. She is a homeschooling mom of three daughters, wife of one mail man, and a people-watching introvert who can be found hiding in the nearest corner. 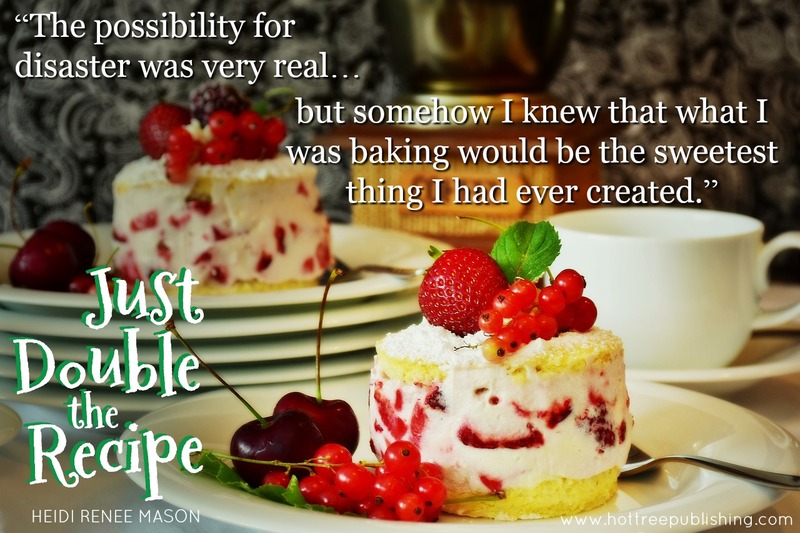 She is an Amazon best-selling author, and writer of your next happily ever after. Visit my publishers at www.solsticepublishing.com and www.hottreepublishing.com!